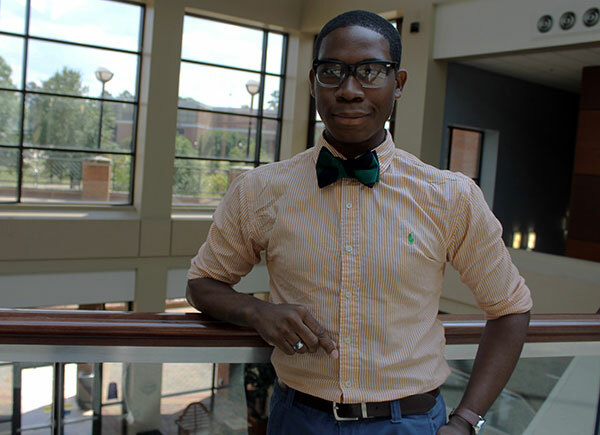 A Student Life leader, DeMarcus Beckham is committed to public service and activism. Full Name: DeMarcus Shyheim Beckham. High School: At Pike County High School, I was president of the Y-Club and Environmental Green Club." Degree Objective: Bachelor of Arts in History with a minor in Political Science. Activities: "Currently, I am serving on the Diversity Ad Hoc committee of the Academic Assembly and as president of the Gay-Straight Alliance and the History Student Organization. I'm also layout editor of the student newspaper, 'The Statement,' and I've assisted in the play productions. I knit hats and scarves for the homeless in my spare time. In the summer I help run a nonprofit educational summer camp in Concord, Ga., called R.E.A.C.H, which is also a food bank." Career Goals: Become a project manager in business or work for a non-profit/social service agency. He chose Middle Georgia State University because … "Originally I wasn't going to stay long at MGA. I was going to get my core classes and then transfer to another university. Believe it or not, a mistake on my transcript led me to being classified as a history major, but it turned out to be one of the best mistakes in my life and I ended up staying at Middle Georgia State. I enjoy being around people who are hungry to understand historical events, legislative policies, the people who came before us and the world around us." The greatest thing he discovered about Middle Georgia State was … "An obliging staff and student tutors, along with the opportunity to meet challenges. I have been blessed to have Professors like Mary Gareis, Dr. Sheree Keith, Dr. Andre Nicholson, Dr. Charlotte Miller, Dr. Niels Eichhorn, Dr. Matthew Jennings and Dr. Matthew Zimmerman, who all push and motivate me and provide me opportunities to climb higher." His greatest academic experience as a Middle Georgia State student has been … "I'm very passionate about the history of minority groups, especially LGBT history. In early September, I was asked to participate in some panel discussions by Georgia Equality and In The Life Atlanta Inc. to give insight on LGBT history. I was honored to be chosen and and stand alongside some of my great political heroes. That experience only expanded my love of history and desire for social equality for all." To him, greatness means … "Knowing that I have put something positive out into the world. A hundred years from now no one is going to remember the things I have done, but that does not mean that I should not put those things out into the world."